Sony Pictures has cancelled the planned US release on 25 December of the film The Interview, after major cinema chains decided not to screen it. The film is about a fictional plot to kill North Korean leader Kim Jong-un. Hackers have already carried out a cyber attack on Sony and warned the public to stay away from cinemas screening the film. The US government said it was considering a "range of options" on how to respond to the attack. "We know that criminals and foreign countries regularly seek to gain access to government and private sector networks - both in the United States and elsewhere," a National Security Council statement said, adding that the FBI was leading the investigation. "We take very seriously any attempt to threaten or limit artists' freedom of speech or of expression." The statement came after US media quoted anonymous officials as saying that the FBI had linked North Korea to the attacks. 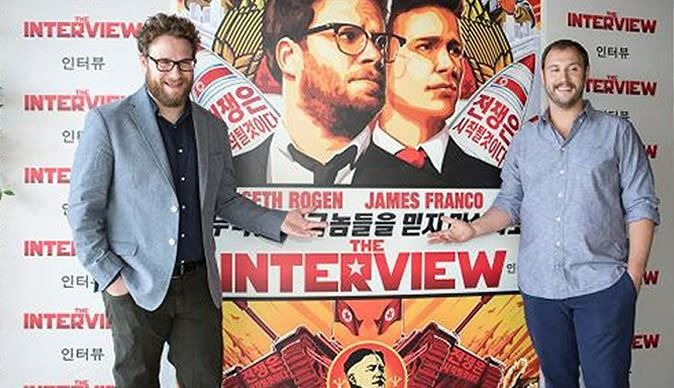 Earlier on Wednesday, the New York premiere of The Interview was cancelled. Sony says it understands its partners' decision. However, in a statement it said it was "deeply saddened at this brazen effort to suppress the distribution of a movie". "In light of the decision by the majority of our exhibitors not to show the film The Interview, we have decided not to move forward with the planned December 25 theatrical release," it said. "We respect and understand our partners' decision and, of course, completely share their paramount interest in the safety of employees and theatre-goers." It added: "We stand by our film makers and their right to free expression and are extremely disappointed by this outcome." Hackers calling themselves Guardians of Peace have released emails and data stolen from Sony in late November. In a recent warning they mentioned the 9/11 attacks, claiming "the world will be full of fear". "Remember the 11th of September 2001. We recommend you to keep yourself distant from the places at that time," the hacker group wrote in a message on Tuesday. "Whatever comes in the coming days is called by the greed of Sony Pictures Entertainment." Earlier, Sony had given theatres in the US and Canada the option to bow out of showing The Interview in the wake of the threats. Regal Cinemas, AMC Entertainment and Cinemark Theatres - the top three theatre chains in North America - subsequently announced they were postponing screenings, and Canada's biggest theatre firms also pulled out, leaving Sony seemingly no choice but to postpone the film. Comedian Jimmy Kimmel tweeted that the decision by theatres to refuse to show the film was "an un-American act of cowardice that validates terrorist actions and sets a terrifying precedent." The Interview cost Sony an estimated $42m (£27m) to produce - not nearly as much as action films like The Hunger Games or the X-Men films - but still a significant amount for a comedy film. So far, however, investors have not been too concerned about the potential hit to Sony's bottom line. Sony's share price has declined by just over 5% since the hack was revealed. An effort by activist shareholder Daniel Loeb to get Sony to spin off its entertainment arm was thwarted in 2013, but the hacking revelations and their subsequent hit to Sony's reputation could renew calls to reconsider the structure of the firm.